In this year’s two most prominent gubernatorial races, the Republicans have taken what probably should have been victories and put them into doubt by selecting weak nominees. Whatever the results, the GOP better hope that these races are not harbingers for 2016. Because while deep-red Kentucky and Louisiana still might ultimately vote for flawed Republican candidates this year, the country probably will not do the same next year. First of all, in Kentucky, it appears to us that the Democrats are now small favorites to hold the governorship. We are moving the race from Toss-up to Leans Democratic. Most of the available information in the Bluegrass State’s governor’s race, which is five days away, suggests that Attorney General Jack Conway (D) is outperforming businessman Matt Bevin (R). Conway has led every recent public poll, although there have not been that many of them. Conway was even narrowly ahead in a Bevin internal poll. Bevin has not done a good job of uniting his party after winning the GOP primary by 83 votes, and he has engaged in unnecessary confrontations and petty, wasteful food fights with his rivals and the state’s media. He is one of the most argumentative candidates we can remember. The Republican Governors Association exited the race in late September, ostensibly to send a message to the wealthy Bevin to open his wallet, and Bevin did. Last week, the RGA got back in, but because of Conway’s strong fundraising, the Democrat and his allies probably still have a lead in the air war, an advantage they’ve had for weeks. One sharp observer speculated that the RGA might have re-emerged in the race more to prevent a down-ticket collapse than to save Bevin. We know from recent press reports that Senate Majority Leader Mitch McConnell (R-KY) is getting antsy over Sen. Rand Paul’s (R-KY) floundering presidential bid and wants Paul to take his 2016 Senate reelection more seriously. We also know that state Auditor of Public Accounts Adam Edelen (D) is a talented down-ballot officeholder who could run against Paul if Edelen wins reelection next week. A weak performance by Bevin could hurt the entire GOP down-ticket. Any boost the RGA gives Bevin would probably help down the ballot, too. The RGA executive director tweeted on Monday that the race was “now tied” — which, of course, includes results within the margin of error. The fundamental problem for Conway is that the state is so anti-Obama and Republican at the federal level. Even though Conway leads, he’s not at or really even near 50% in polls. An independent candidate, Drew Curtis, is polling in the mid-single digits, pulling about evenly from both candidates, according to the most recent Bluegrass Poll. He may not end up doing that well, and maybe a Curtis drop-off combined with a late-break among conservative-leaning undecideds could help Bevin sneak through. It’s a plausible alternative if — and only if — Bevin can grab the late momentum. But we have to go with the evidence we have, including polling, spending, candidate performance, and the opinions of our sources. All those factors point toward Conway. If Bevin loses, he, and the Republican Party both in Kentucky and nationally, will have squandered a golden opportunity. On Saturday, Sen. David Vitter (R) and state Rep. John Bel Edwards (D) advanced to a runoff in Louisiana, which is scheduled for Saturday, Nov. 21. The Vitter-Edwards matchup has seemed likely for months, but Vitter comes in weaker than expected: He won just 23% of the vote in the all-party primary, finishing ahead of two Republican rivals. Vitter took on water in the latter stages of the primary, taking fire from both Republican and Democratic opponents over his use of a DC prostitution service several years ago and for flip-flopping from supporting to opposing Common Core education standards. Despite being rivals with Gov. Bobby Jindal (R), Vitter has had a harder-than-expected time distancing himself from the unpopular outgoing chief executive. And, this being Louisiana, weird stories have emerged, such as Vitter’s connection to a private investigator who was arrested by a rival parish sheriff for videotaping a conversation between the sheriff and some Edwards supporters. Edwards, who is pro-gun and opposes abortion rights, got about 40% of the vote. So both candidates start far short of the 50% needed to win the two-man runoff. Vitter will need to more than double his percentage, although the three combined Republicans won 57.3% of the vote. In order to win, Edwards would need to capture roughly a quarter of the votes cast for the other two Republican candidates, Public Service Commissioner Scott Angelle and Lt. Gov. Jay Dardenne. In other words, both candidates have steep climbs. The most recent runoff election in the Pelican State, the 2014 U.S. Senate race, saw a 13.5% drop in total votes from the jungle primary to the runoff. 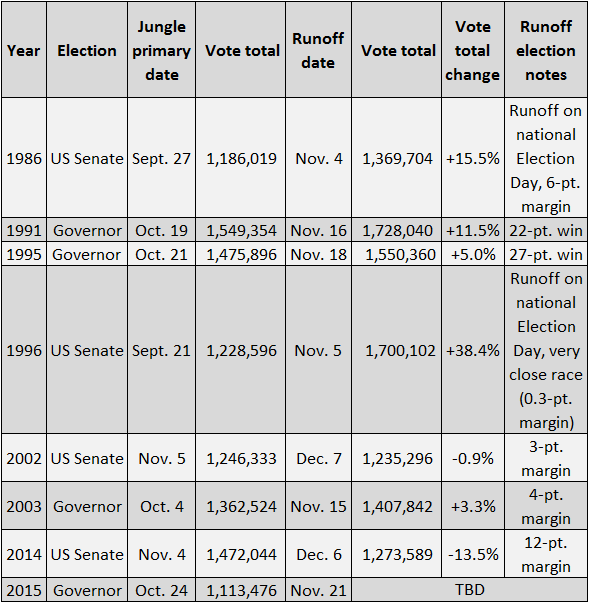 But over the last 30 years, all other runoff general elections for governor or U.S. Senate have seen either little change or substantial increases in turnout (though in the two largest cases the runoff occurred on the national Election Day in November, an obvious explanation). The comparative figures for major statewide elections over the past 30 years are presented in Table 1. Notably, no gubernatorial runoff in this period has seen lower vote totals in the second election, even in uncompetitive blowouts. This leads to two as-yet unanswerable questions: Will some Republicans decide to vote for Edwards despite his partisan affiliation? And might some Republicans opt to simply not show up out of spite towards Vitter, perhaps leading to an unusual downtick in gubernatorial turnout? The Republican Governors Association has already been attacking Edwards as a President Obama clone — a rinse and repeat message for the GOP in a conservative state — while the Democratic Governors Association, after staying out of the race before the jungle primary, is dipping its toes in, making a small $300,000 buy on a smart, harsh ad using criticisms of Vitter from before the primary by Angelle and Dardenne. We still think Vitter has a slight edge in the runoff despite the ground he needs to make up because of his party label. But we’re far less confident in the outcome than we were, so we’re moving the race from Likely Republican to Leans Republican. In fact, Toss-up might even be more warranted, but we’ll wait to see how the contest develops before going that far.